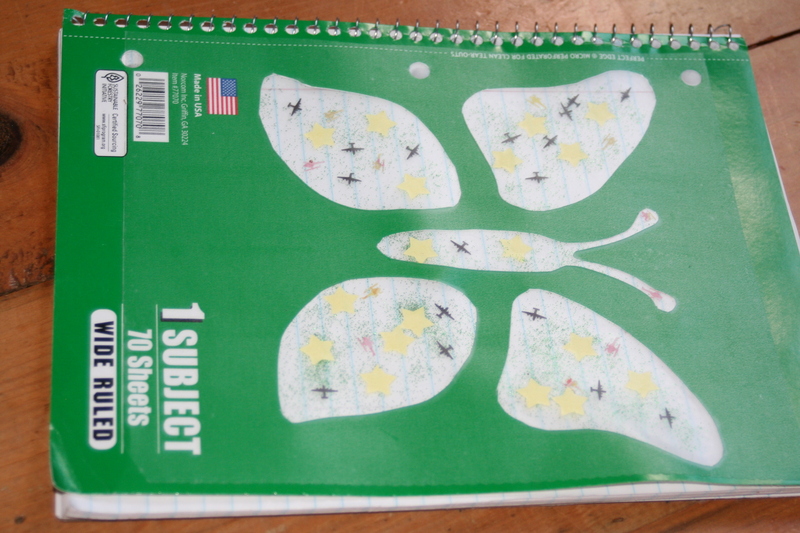 These butterfly notebooks were the craft for day 4. With school upcoming, this seemed like a fun and practical craft that should really be useful. I made some other versions for my girls at home- definitely a neat back to school craft as well. They are a bit time consuming to prepare, but it’s a neat craft that sticks nicely to the butterfly as a theme for the Resurrection (the bible story for the 4th day of VBS). 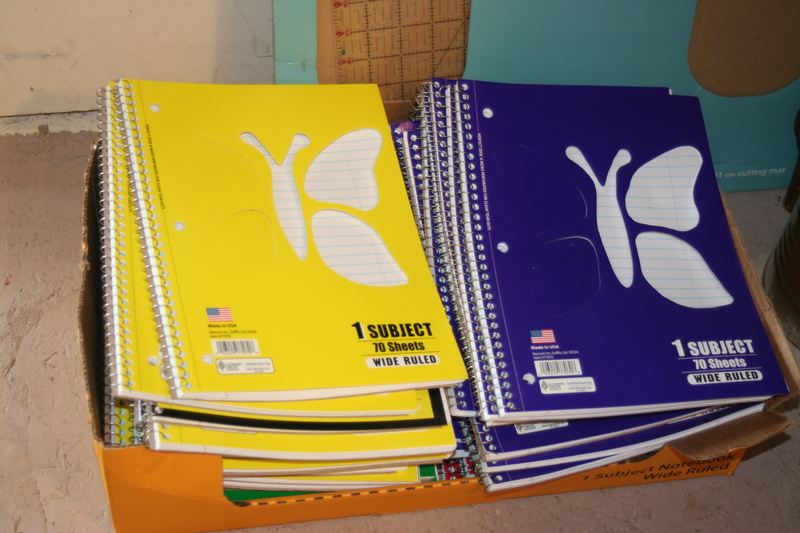 I got spiral notebooks at the back-to-school sales. 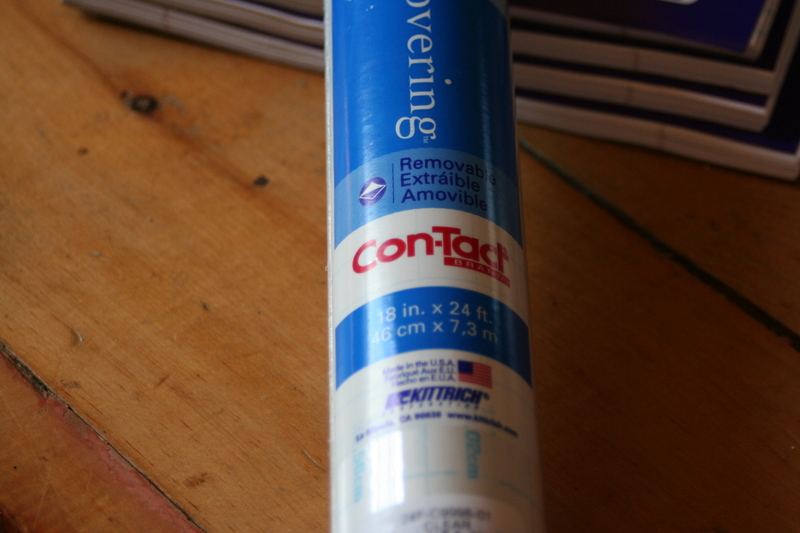 Clear re-positionable contact paper comes in a roll 18″x24′. I think other sizes were also available. 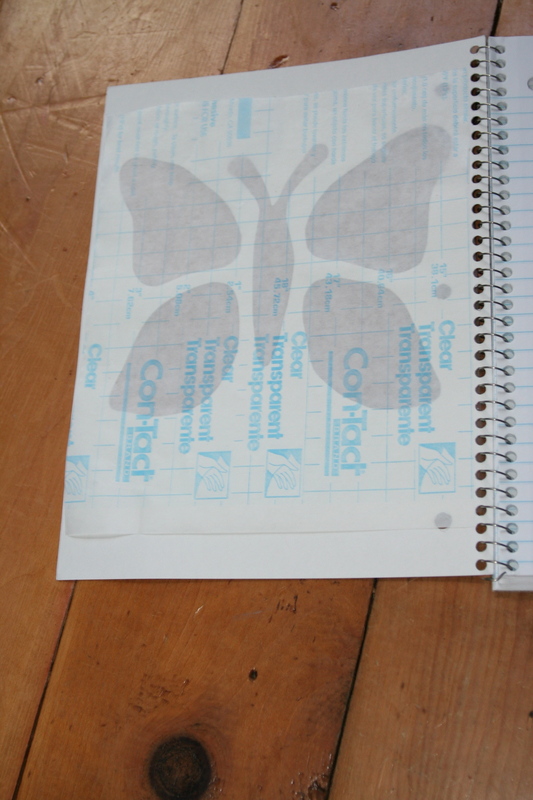 My butterfly was really a simplified blown up version of a butterfly stencil. The copier did all the hard work for me to size it, then I just transferred it onto a piece of cereal box to make a stencil. Of course, any object will work, or letters. 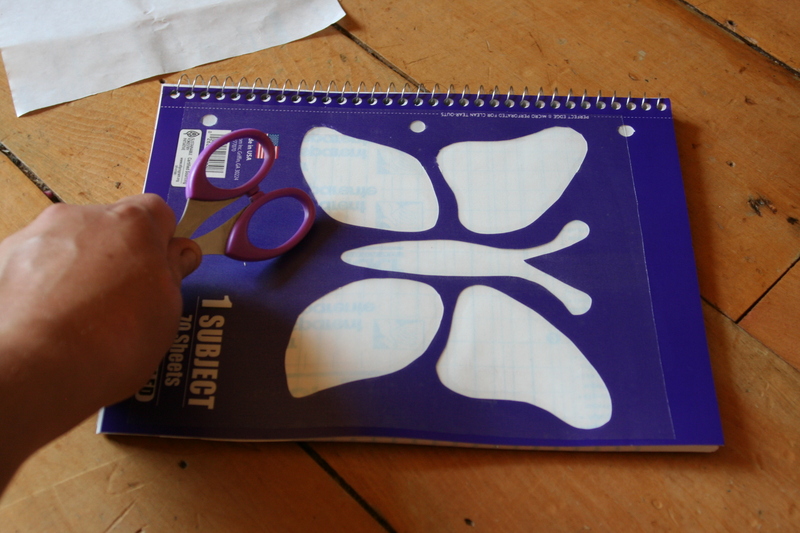 Use your stencil to trace your shape, or free hand it. Small scissors or an exacto knife work well for cutting out the shapes, but I had a free-form shape cutter that I’d used for one of my crafts last year (someday I’ll post about it) that sped things up quite a bit to make the number I needed. 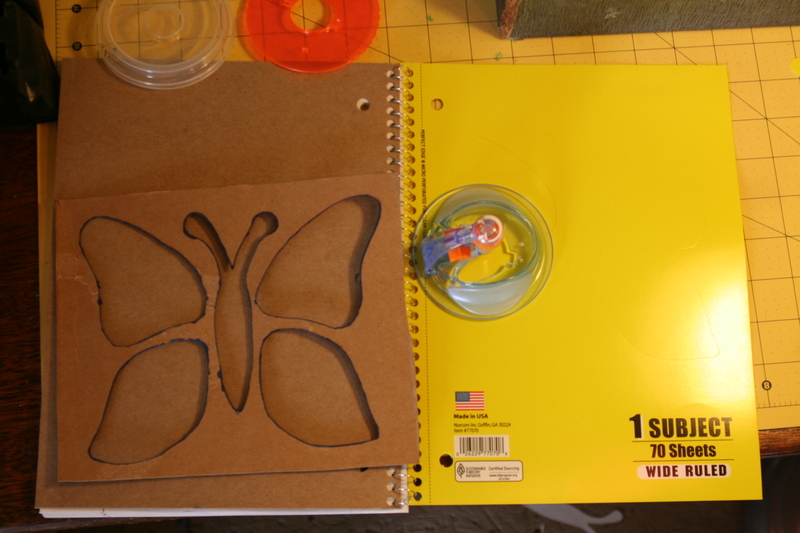 I couldn’t cut them out completely with the free-form cutter since the base of the cutter wouldn’t go over the spirals in the notebook, but it was simple to cut the rest of the wings with scissors. Whatever shape you use, remember to keep them simple if you have a lot to do! 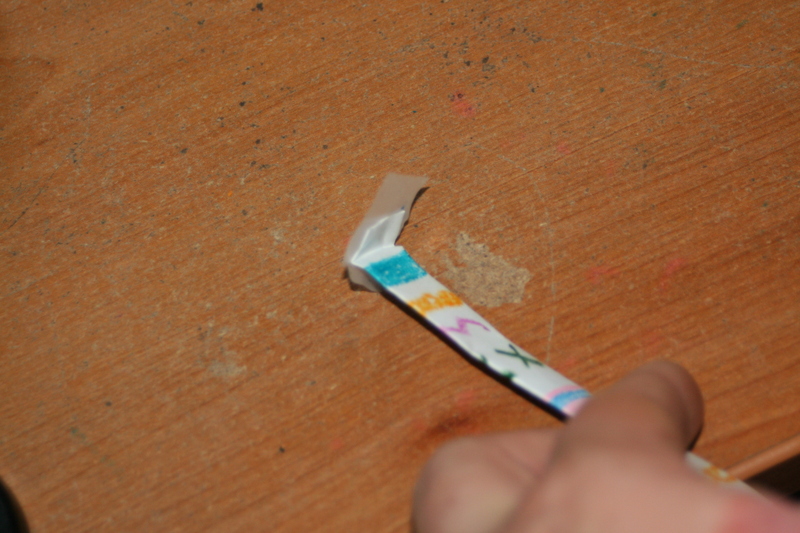 Once the shape is cut out, you move on to the contact paper. 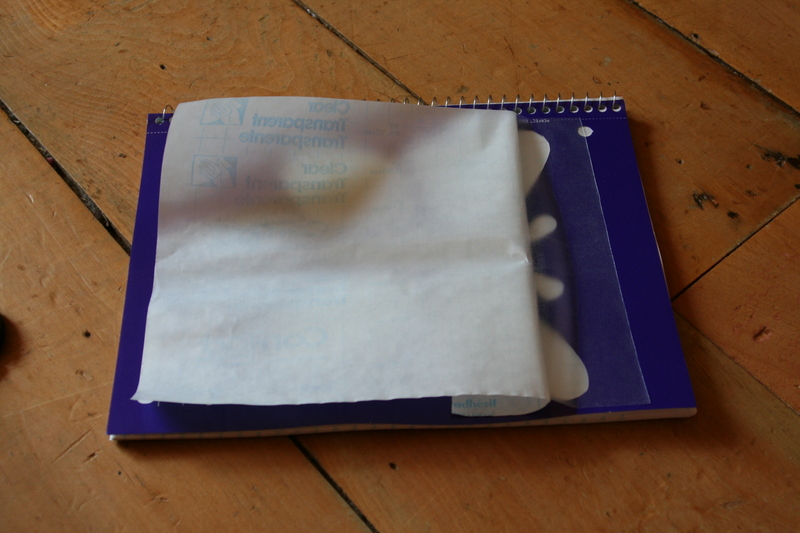 I put on the outside layer for each notebook and left the paper backing inside so that it wouldn’t adhere to the first page. This stuff is forgiving and re-positionable, especially for the outside piece. The size of your piece will vary based on the size of your cut-out shape. Just make sure it overlaps your shape by at least 1/2″ or so. 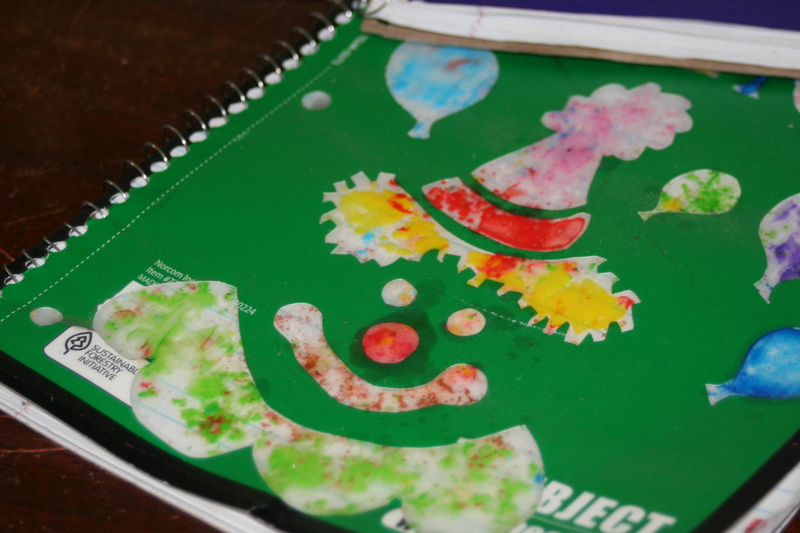 I cut the inside piece of contact paper and slipped it into each notebook for after the kids decorated them. 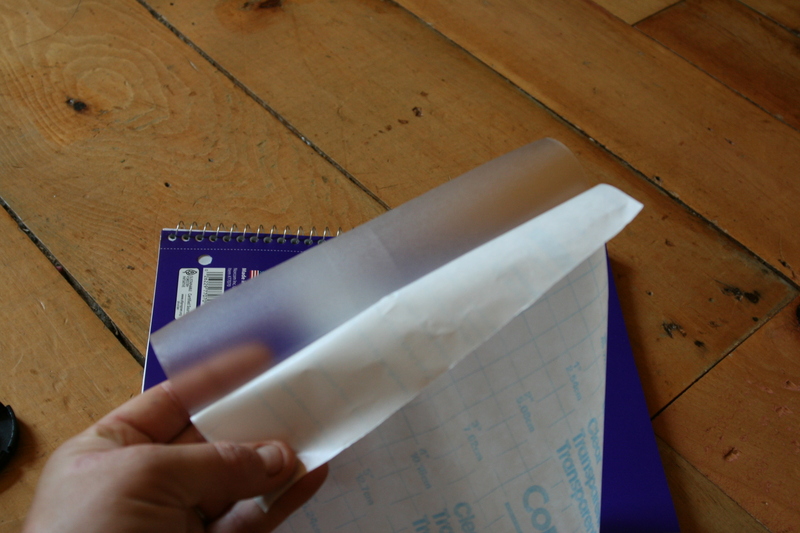 Regarding applying that piece of contact paper, you can take the whole backing off and set it on like a giant sticker- reasonably easy to do. 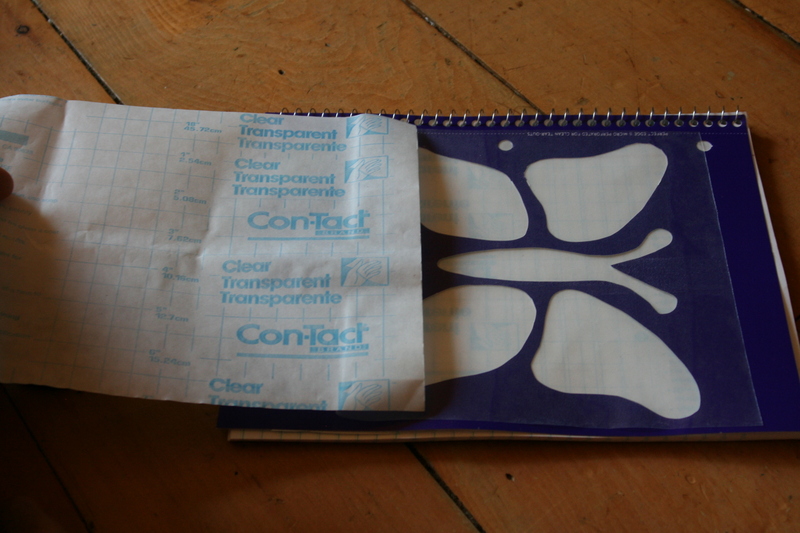 But for the kids to do it (and maybe adults, too- whatever you prefer), this is a better method: Start to remove the backing from one edge of the contact paper. Set it on the cut out shape and adhere the edge, make sure the whole piece sits squarely over the cut-out. Then pull the loose edge of the paper backing from underneath the contact paper and smooth it down as you pull off the backing. I did “burnish” the surface to get it to stick better once it was properly placed, but only for the front- the kids didn’t burnish the inside. 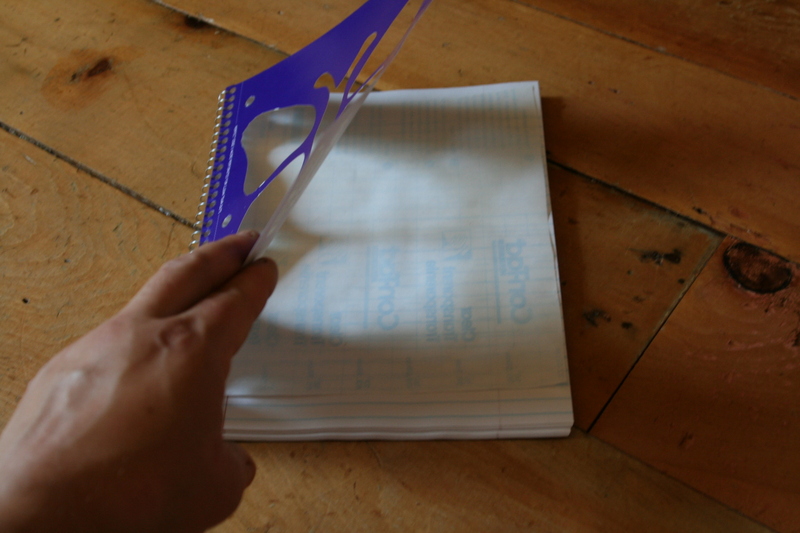 To burnish I used the handles of my scissors to rub the contact paper and get it to adhere better to the notebook. Now for some inside decoration. 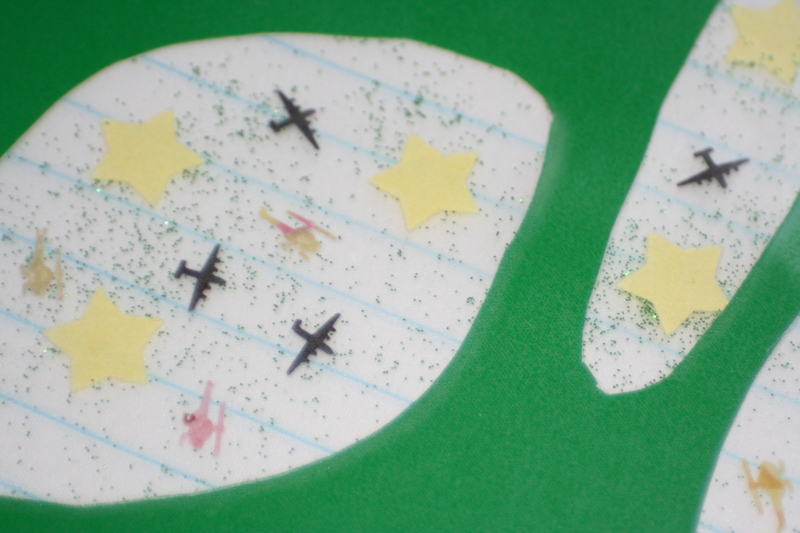 I used shaped paper punches (butterflies, stars, helicopters, and planes) and fine glitter in the little shaker containers. 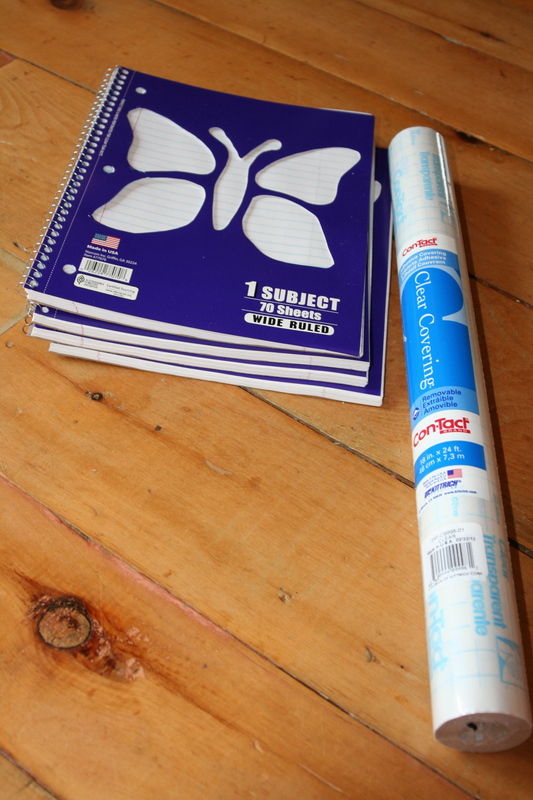 I punched a full 8 1/2″x11″ paper of each, and for 66 kids that was sufficient. 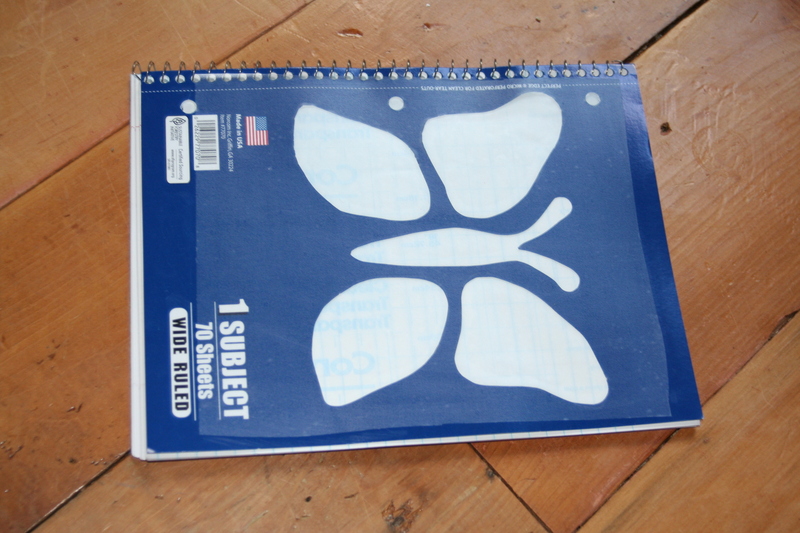 It also kept things simpler with only one color choice for each punched shape. Adults handed out the shapes to the kids- a small pinch of punched shapes goes a long way. I handed out the last of my stars and almost all my butterflies to the last crew that came through, but no one lacked any. Stick the paper punch outs on first, then the glitter. Don’t get too crazy with the glitter, or less of the contact paper will stick. Also, be sure to brush off excess glitter from the inside cover before trying to put on the contact paper so it has more places to adhere to seal in all those decorations. I tried crayon shavings at home and melted them with an iron after I put the contact paper on. They turned out okay, but the melted crayons aren’t an appealing look where they seep into the notebook cover. It’s most obvious around the clown nose below. 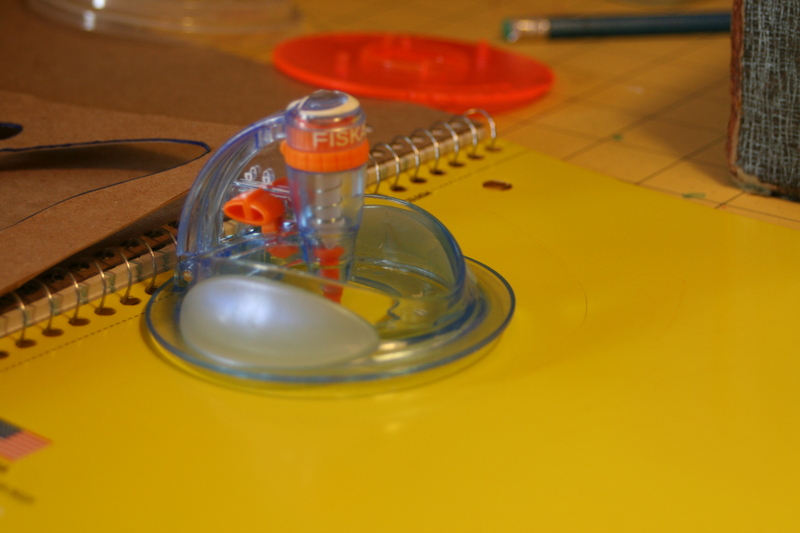 This is the first of a series of posts on VBS crafts. 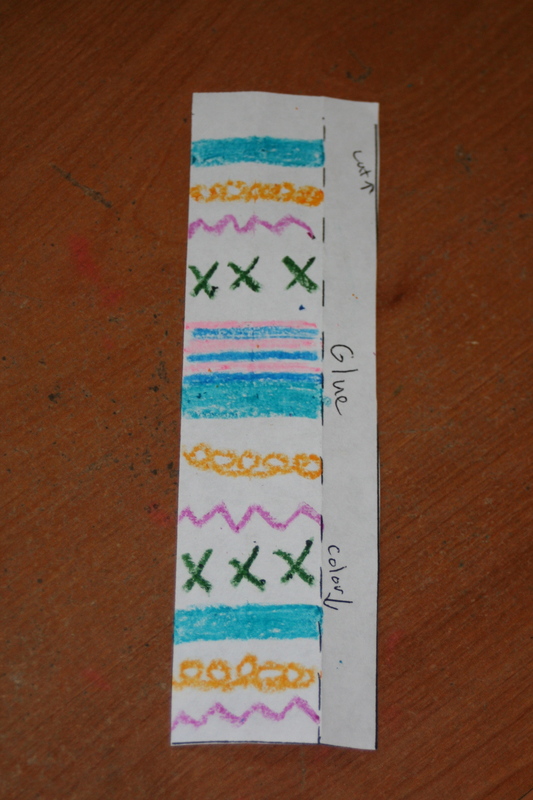 For more group kids crafts ideas, check my VBS tab. We did these on Day 1. They’re kind of like sanitary spit wads. I used the tutorial over here at Curious Kangaroos. 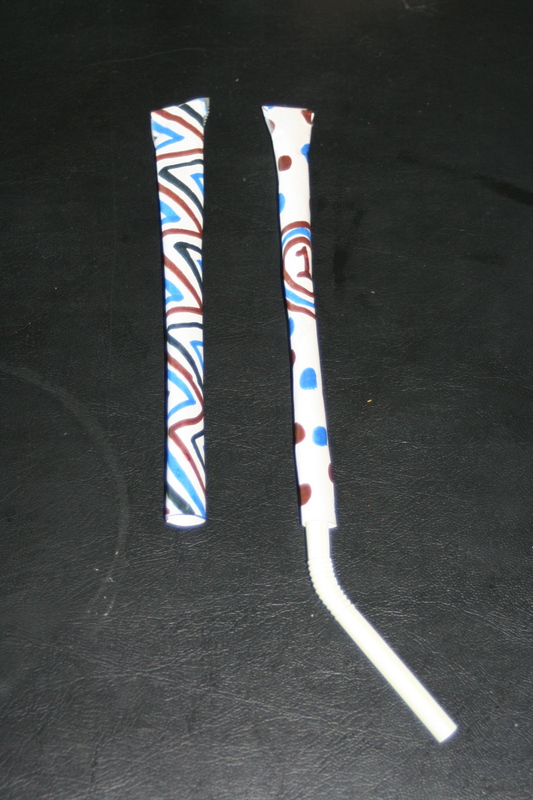 Make sure the straws are on the bigger side (diameter), or it’s a poor show. You want to puff a lot of air through the straw in a hurry for them to fly well. 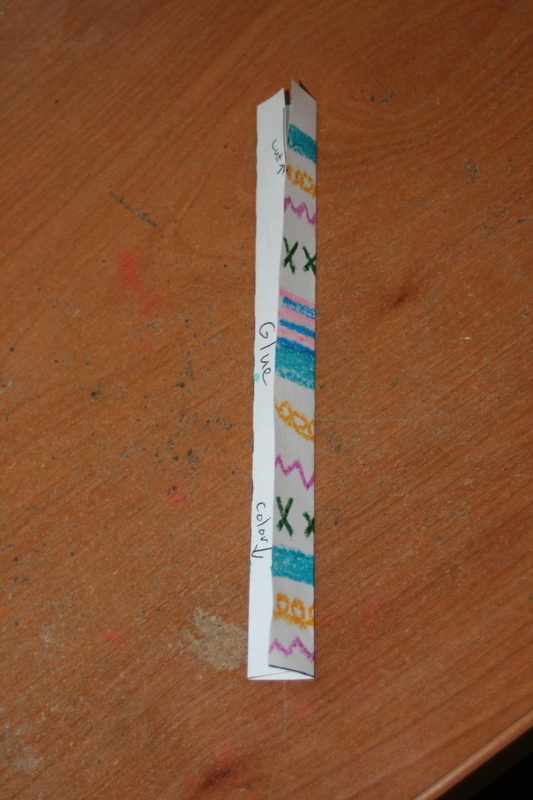 Details for preparing for a group: I drew lines on one sheet of paper so each kid will get to color 6 straw rockets. I photocopied the sheet (lazy me…) and that’s about all the prep for this one. The kids colored the rockets before cutting them out. (The writing on the bottom edge will not make it into a copy unless you can adjust your copier to go to the edge of the page. Also note below, my assembly instructions would change a bit if I were to do it again). 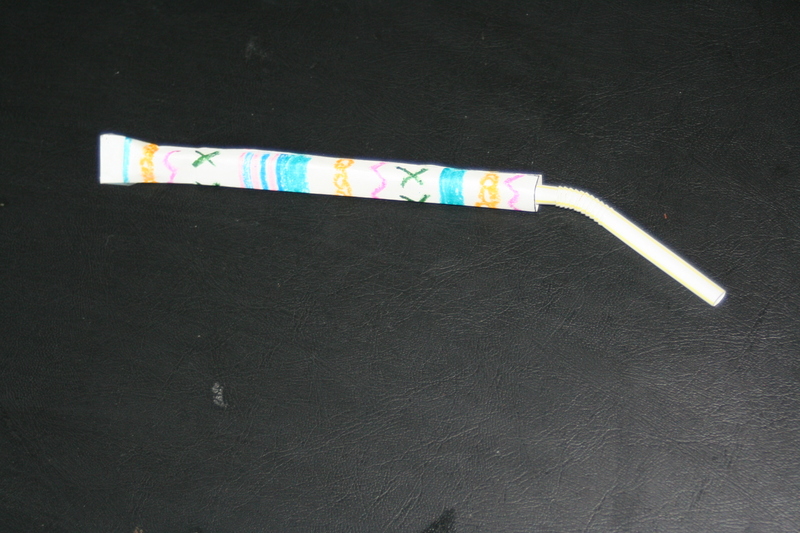 Due to time restrictions, it worked best to let them color, cut, and assemble ONE rocket before completing any more. 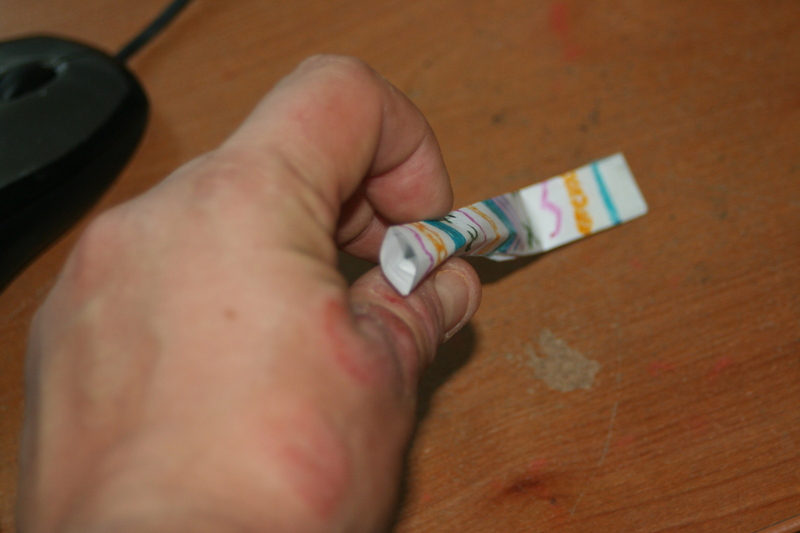 Wrap on a pen or pencil (make sure it’s a bit bigger than your straws). Glue. (NOTE: do NOT glue while flat before wrapping. 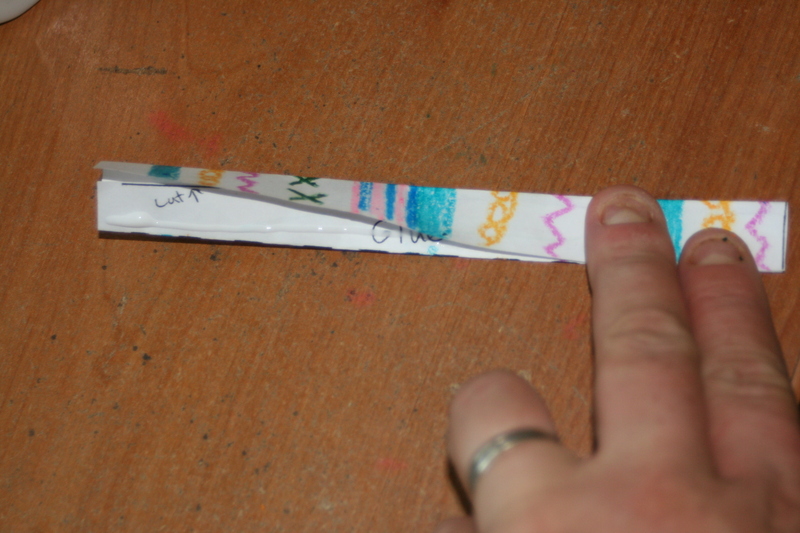 It works better to wrap so the paper is curled closer to it’s final shape before glueing). Clip on clothespins to help hold it while it sets for a couple minutes. ****While the above is the way we did it, I would save a lot of headache and time if I were to do it again. I would just have them FOLD the rockets- skip the wrapping around pencils to glue. 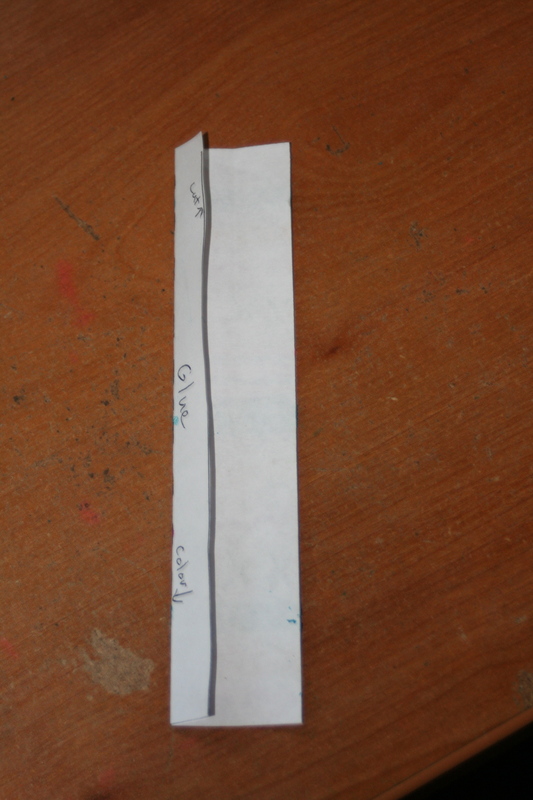 Fold on the dotted “glue” line and then fold the remainder of the rocket in half over to the “glue” line. It won’t affect end performance and will make it tons easier to assemble. Then fold down the top and tape. Repeat for each rocket. Done! All the pieces went into a little baggie to go home. I gave them straws AFTER the rockets were made to keep everyone’s mouth on their own straw and to keep them on task until finished. If you have time (we didn’t)- give the kids some challenge for practicing aim and distance with targets, landing strips, etc. Hang up hula hoops, cut shaped holes in a tarp and line with tape, or tape a landing strip on the floor- however you want to do it. Let them play! I love this stuff! To use, rub on hands or body. Also good as a chapstick. It’s done a good job for me of keeping some eczema at bay that I developed in the past year on my thumb and eyelids (Odd locations- who knows why?!). I don’t have to worry about continued exposure and potential side effects to the prescribed steroid ointment, and I can use it on my face, unlike the ointment. I’ve also used it effectively on my kids for diaper/wet underwear overnight rashes. Instructions based on a recipe found here at Crunchy Betty. 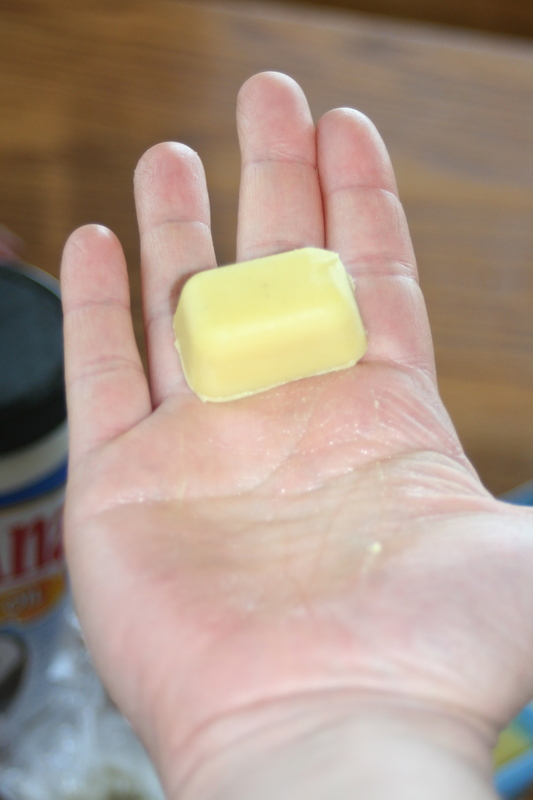 Very simple, 3 ingredients- beeswax, coconut oil, and shea butter. 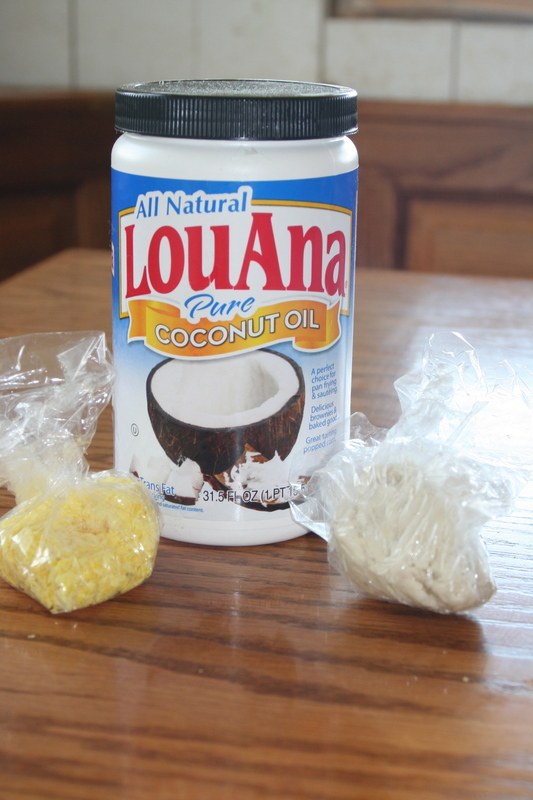 There’s a recipe at Little House in the Suburbs that I haven’t tried, but it does contain more common ingredients- namely, shortening and vegetable oil instead of coconut oil and shea butter. Both use beeswax. I’m not sure how solid the other version would be, or how greasy it may feel. I used an electric fry pan with water to function as my double boiler for this group craft. I set it to about 250. 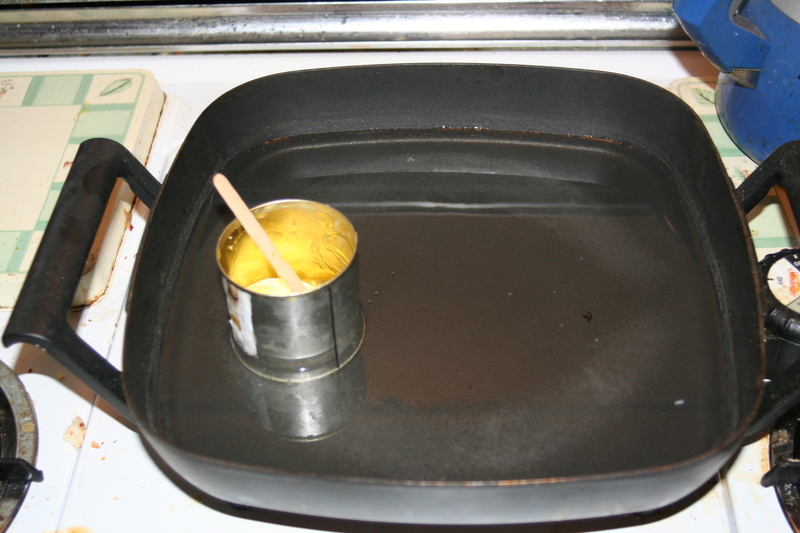 You can also do this in a pan of water on the stovetop or in a (microwave safe) container in the microwave. The can is a mushroom can- any similar small clean can would work- I wouldn’t recommend glass for this due to temperature change, though. You can use glass if you’re going to do this in the microwave instead of a double boiler. I did have to add water over the course of our time at spa day, since the water evaporated relatively fast. Just don’t add too much, or your cans may tip over! The stir stick is just a popsicle stick. I had no trouble lifting the can without a hot mitt, and we had no trouble at our Spa day. But use caution, your can MAY heat up and could cause a burn if left too long or if the water is particularly hot. 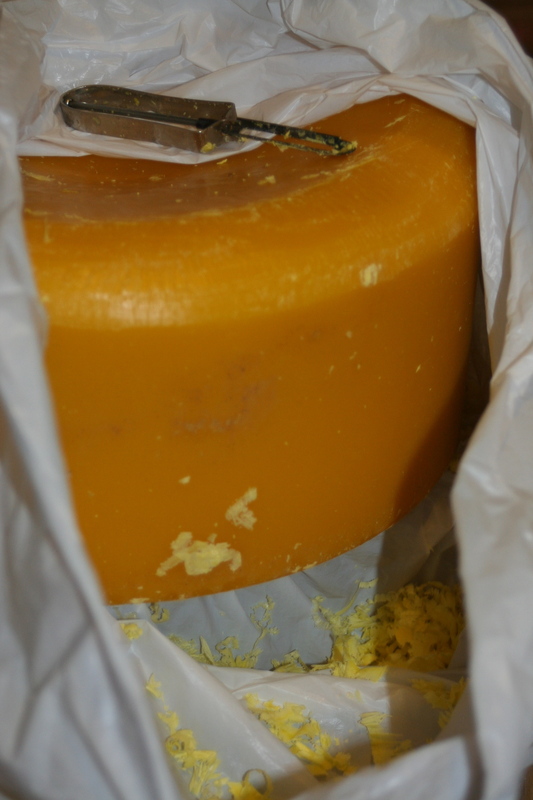 1/4 cup lightly packed grated beeswax. Mine is straight from the bee keeper, but any kind should work. 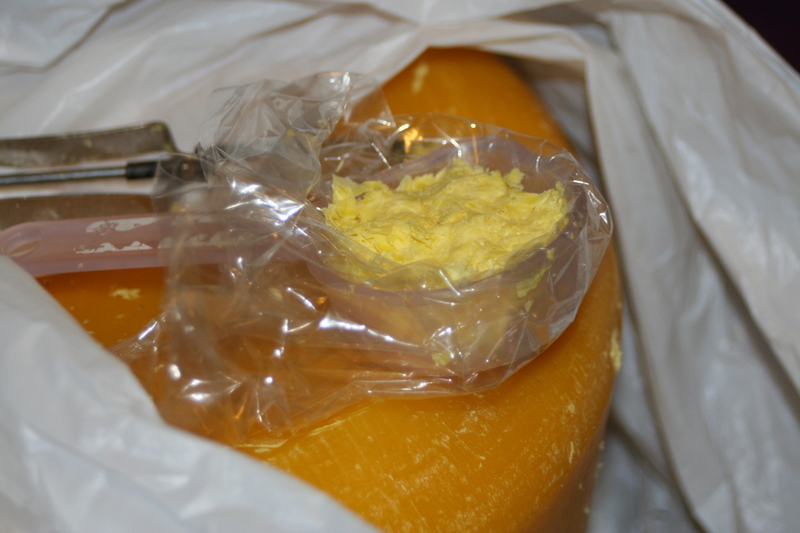 I used a peeler to grate off thin pieces of wax, then lightly pressed in a baggie lined measuring cup. 1/4 cup coconut oil. 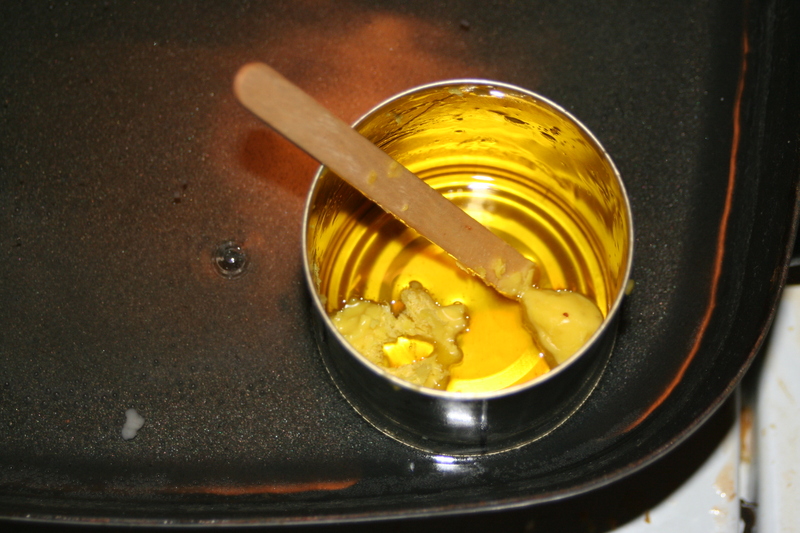 The “solid at room temperature” oil contributes to the firmness of the final product. Liquid oils make a very slimy, melty bar. I did heat the oil in the jar so it was liquid to make it easier to scoop out 1/4 cup for our spa day. 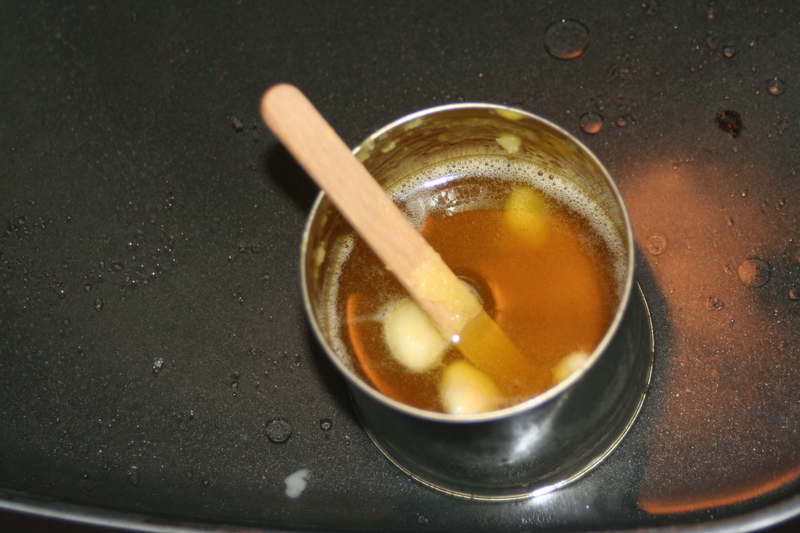 It will still need to be re-melted after adding it to the beeswax since it has such a lower melting temperature. 1/4 cup shea butter. Mine is natural, unrefined. This is the only thing I had to buy online- I couldn’t find it at any stores locally. This scooped beautifully with a trigger icecream scoop into a baggie- the scoop holds 1/4 cup. Melt the beeswax. Add the coconut oil and allow all to heat/melt again. Last, add the shea butter last and keep on heat just until melted. I’ve run across info that it can get “grainy” if heated too much and too long, but I didn’t experience it myself. Stir occasionally after each addition. I took the can off the heat to add items- less chance of dropping extra bits in your water, and it will help with space for a group craft. 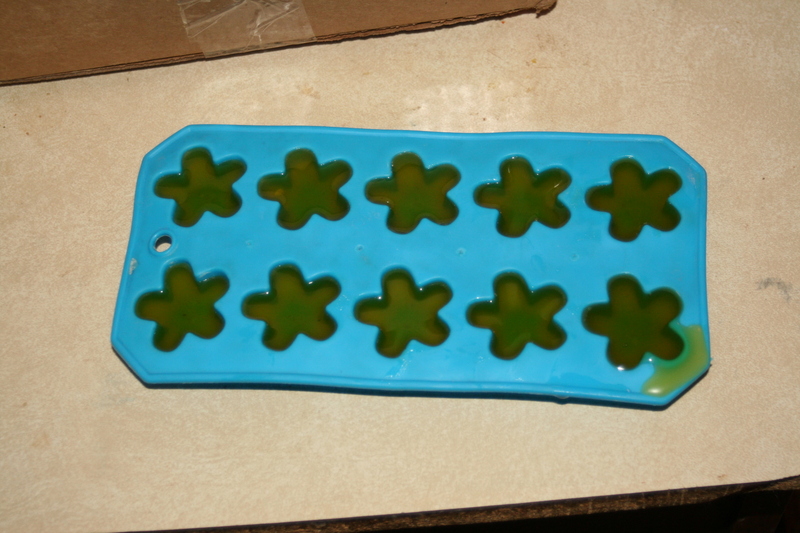 Immediately pour into forms- we’re using ice cube trays form the dollar store. This recipe just fills the silicone one with possibly a touch extra or a touch less. Unfortunately, they didn’t have them anymore when I went to buy trays, so I just got regular ones, and it didn’t fill the whole tray. We put names on with a sharpie marker. Let it cool when you’re done. I put mine in the fridge because I’m impatient. We had fridge space and did the same for our MOPS spa day. It doesn’t take that long for them to set up. Pop them out of the molds once they’re firm. They pull away from the sides of the molds a bit once they’re fully set. store in a baggie or wrapped in wax paper. I didn’t add scent- I love the smell of the beeswax. But you can if you want to. 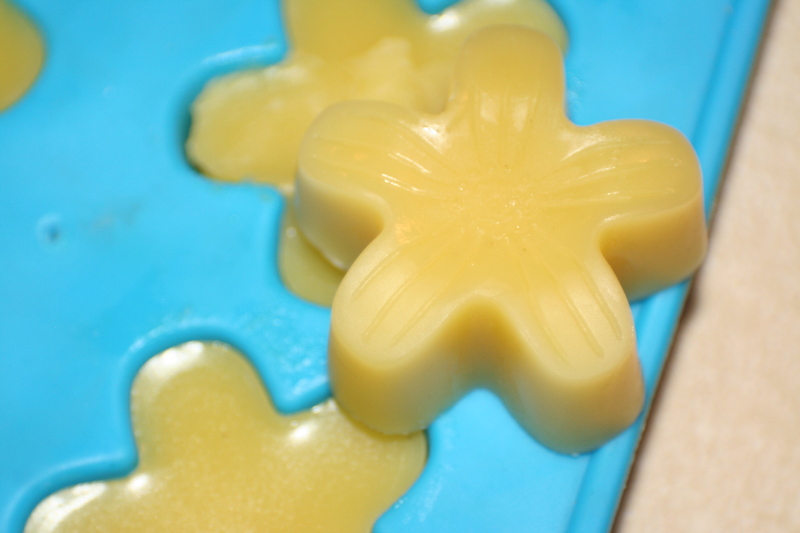 Add your scent after everything is melted together before you pour it into the molds, and make sure it’s skin safe. 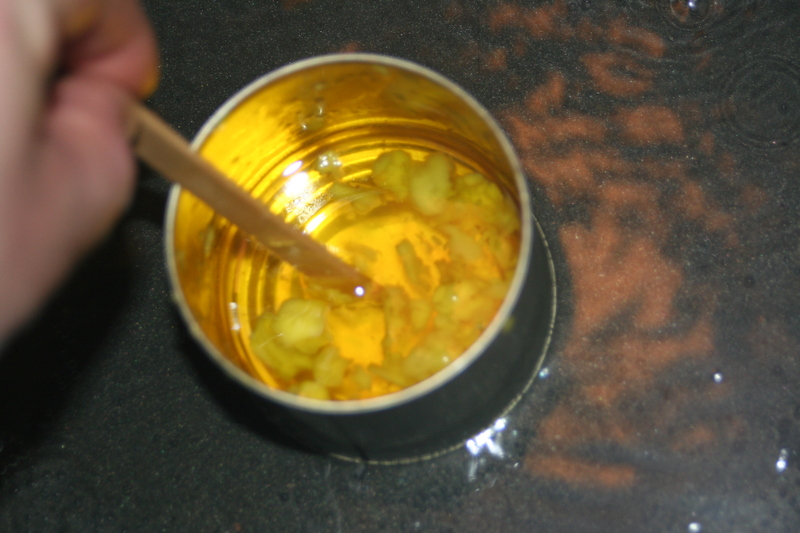 Put 1/4 cup (1 baggie) beeswax in can. Place in hot water bath until melted. stir occasionally with a popsicle stick. Remove from heat. Add 1/4 cup coconut oil. Return to heat, melt, stir occasionally. Remove from heat. Stir until the last of the shea butter is melted. 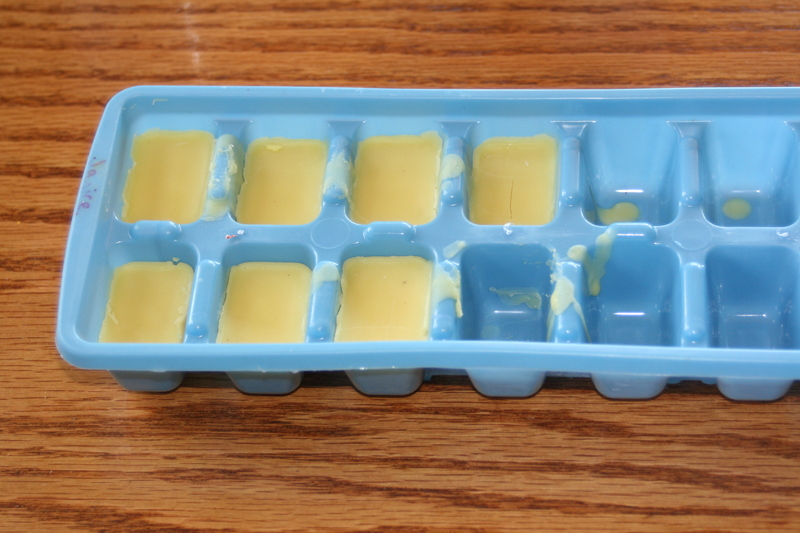 Pour into ice cube trays and set aside to firm up. Can be put in the fridge to speed up the firming process. Pop out of the ice cube tray and store in a baggie or wrap in wax paper to transport. Don’t carry it around in your pocket or leave it in your hot car!